Poppies & Prose: An Introduction. The idea of reading books written about the World Wars actually came to me before I even had a blog. It was nearly a year ago (almost to the day) when the Harry Potter cast were attending the premiere for Harry Potter and the Deathly Hallows Part 1. I guess it surprised me so much because come the end of October until the end of November, poppies are an accessory that I don’t leave the house without. This year is the Royal British Legion’s 90th anniversary and I wanted to do my bit by dedicating the first two weeks of November to only reading books written against the backdrop of the two World Wars. I have tried to find books that I have either never read before or ones that don’t necessarily come to mind when you think of war literature. I wanted to start off this fortnight with a bit of a personal introduction on the wars. Don’t worry, I won’t be giving you a history lesson because I’m guessing if you wanted to know about it you’d have already researched it on your own and if you don’t want to know about how it all started… well, my rambling won’t persuade you otherwise. I just wanted to explain the reason why I am doing this feature on my blog and why I am supporting, and will continue to support, The Royal British Legion. I’m going to begin with a tour of my home town. I live in Stalybridge, a relatively small town at the foot of the Pennines, around 10 miles east of Manchester city centre. 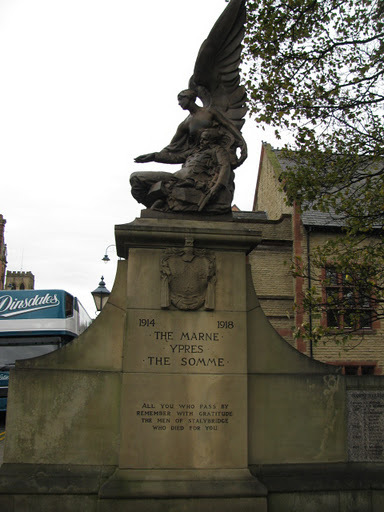 Like every town in England, it has a war memorial to commemorate the men of Stalybridge who have died in wars over seas. 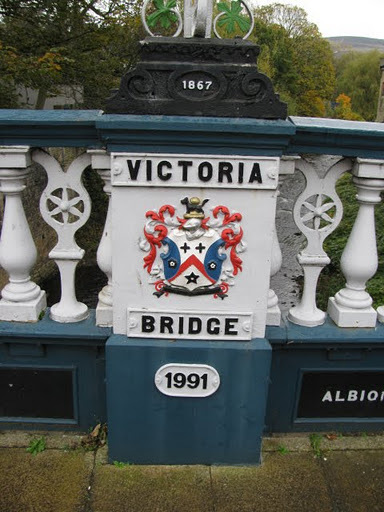 This is Victoria Bridge and crosses the River Tame (not to be confused with the River Thames, which is the one in London. I spent far too long adamant that if I walked down the banks of it I would reach our fair capital). 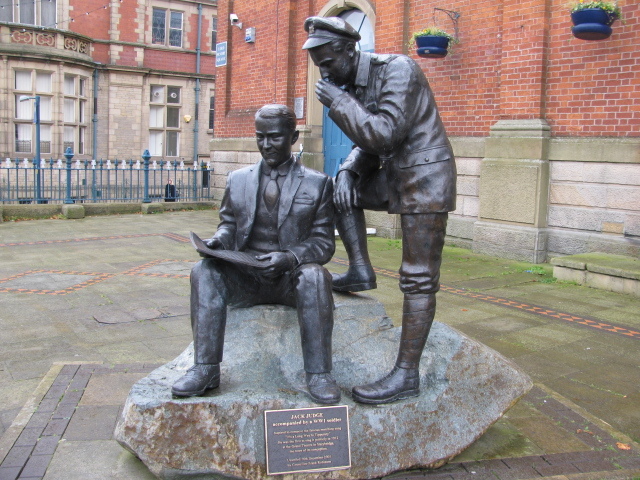 The memorial seen here was unveiled on November 6th, 1921 and virtually every member of the town’s population (24,000) attended the ceremony. The plaques from the First World War contain the names of 628 men. 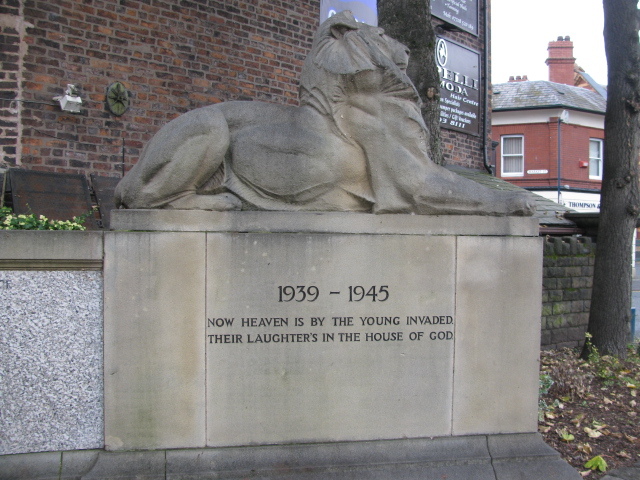 After the Second World War, the memorial was extended to add the names of the fallen. This was unveiled on April 23rd, 1950. This is where, on Remembrance Sunday, wreaths of poppies will be laid and a minute silence will take place. Before we move on, I just want to share another interesting fact about Stalybridge. 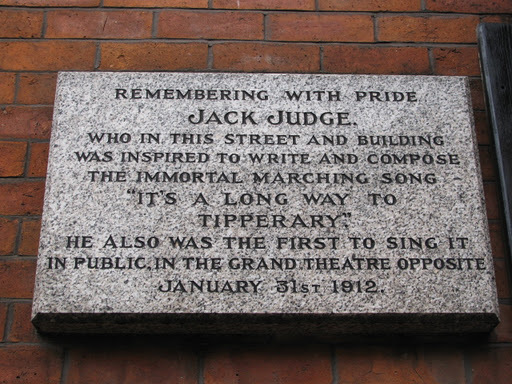 It was here that the well-known song ‘It’s a Long Way to Tipperary‘ was written by Jack Judge. It’s a long way to Tipperary,It’s a long way to go.It’s a long way to TipperaryTo the sweetest girl I know!Goodbye, Piccadilly,Farewell, Leicester Square!It’s a long long way to Tipperary,But my heart’s right there. 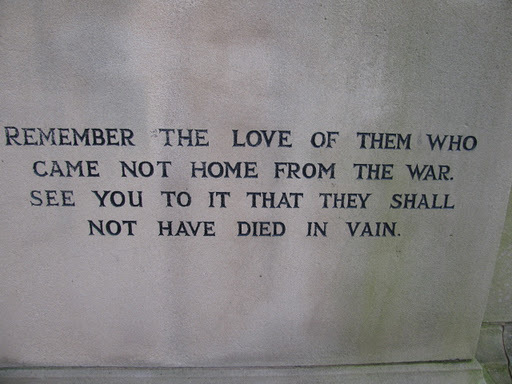 I’ve been lucky enough visit the war memorials scattered across the fields of France and Belgium numerous times. Every year my family used to stay in a campsite quite near to the battlefields of the Somme and I always found them so fascinating. Luckily, my dad shared this passion for history and didn’t mind tramping round Northern France with me as I brandished a notepad and chatted to Australian visitors. The Commonwealth War Grave Commision does an absolutely breath-taking job at taking care of these sites. They make sure the headstones haven’t fallen into a state of disrepair, ensuring the gardens are neat and tidy and maintaining a peaceful place where visitors can remember their loved ones. A couple of years ago, we managed to take my granddad to visit my great great granddad’s grave. 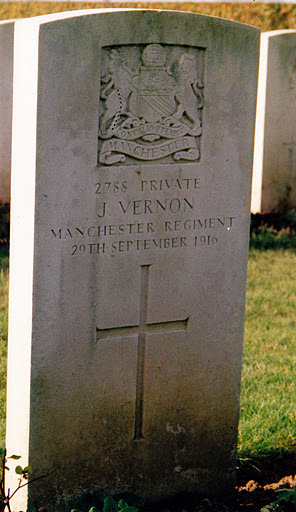 Private John Vernon was part of the Manchester Regiment. He died on 29th September 1916 and is buried in the London Cemetery in Longueval. 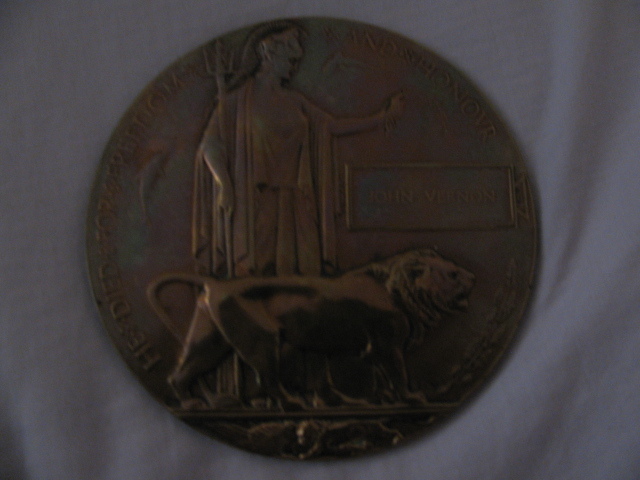 Here is a picture of his Death Plaque, a bronze memorial plaque that were commissioned by the War Council and given to family of every man who died in World War 1. 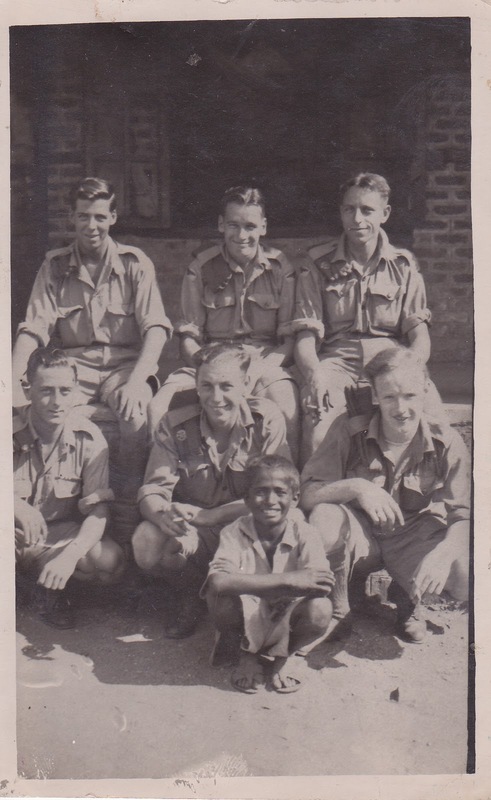 Jumping on a few years and switching over to the other side of my family, here’s a picture of my Granddad Williams (Top row, on the right). He was in the RAF and was based in Singapore in WW2, and he was in charge of maintaining the aircrafts. I have visited the WW2 memorials in Normandy but unfortunately I don’t have any photos. You can find more about them and other battles that were fought in this war here. So, there you go… apologies if this page takes a year to load but I couldn’t not include those pictures. Each year the British Legion helps every generation of people in the Armed Forces, whether it is people who fought in the world wars or who are currently deployed overseas. This is me doing my bit to not only raise awareness for the books I’ll be reading but the organisation itself. My old coat will always have a poppy on this time of the year. This is a great post. I loved all the pictures of the war memorials. I'm always moved when I visit the war memorials here, especially the Tomb of the Unknown Soldier. I didn't know what your new avatar picture meant on Goodreads and I'm glad I do now. I'm a little ashamed to say that WWI/WWII lit has never been high on my pick lists for reading. That's something I need to get over because I am certain I am missing out. Is the Tomb of the Unknown Soldier in America at Arlington? I really want to visit there. One day. In a lot of the cemeteries in France the graves read “Soldier of the Great War Known unto God” because they never found out who they were. Seeing so many of them always moved me. Yes, it is the one in Arlington. The Arlington National Cemetery is so moving to begin with–just hills and hills of white gravestones. The Tomb of the Unknowns sounds similar to the French place/s you've been. They have soldiers who watch over the Tomb of the Unknowns all the time–I like that.